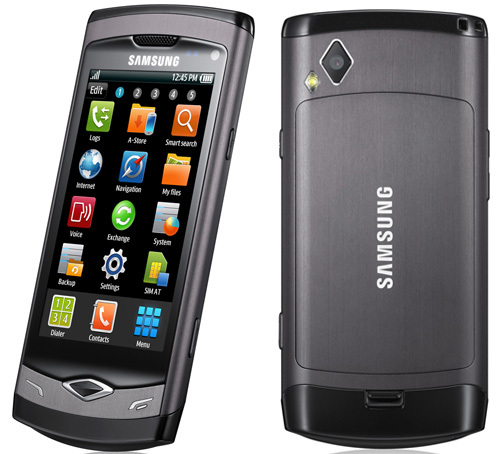 I tested the new Samsung Wave mobile phone for 3 weeks. It feels like a premium phone thanks to the well designed mostly metal case, great screen and multimedia features and yet it is available for an amazing price of $469 outright from online retailer Mobicity or relatively low cost Vodafone cap plans from $29+. The Wave has many features which are unmatched by competitor phones with a similar price like a Super AMOLED screen, 720P video recording, 5MP camera with flash, fast speed, excellent audio quality for phone calls and many multimedia features like built in H264/DIVX HD/XVID video playback, good MP3 player and DLNA network file share capability. However while it’s far better than other phones sold for a similar price it still isn’t a smartphone because the internet related features of the underlying Samsung BADA operating system (web browser, GPS, social apps) are nowhere near as good as iPhone or Android phones and there are very few BADA applications and games available at the moment compared to the iPhone appstore or Android app Market. So is it a Great Budget Phone or a Basic Smartphone? I’d say it’s a great budget phone because a true Smartphone needs to be able to offer a top notch web browsing and social media experience when using Twitter, Facebook etc and have a lot of available 3rd party applications to add to the phone’s inbuilt features. I was commissioned by Mobicity to record this video comparing LCD/AMOLED/Super AMOLED and explaining why Super AMOLED is best. At AU$29 per month, the Samsung Wave lives in a space usually populated with plastic handsets and terrible touchscreens, and stands out as being completely the opposite. The hardware is absolutely top notch, the metal chassis feels great and the Super AMOLED screen stands head and shoulders above phones almost twice the price. The Bada operating system definitely needs a few refinements, but is still better than the vast majority of proprietary systems used by LG, Sony Ericsson and Samsung on previous products. Samsung’s first bada phone is a remarkable achievement, in terms of design and technology. It looks great and feels awesome in the hand. The 3.3-inch screen is incredibly bright and vivid, with some pretty nice detail to it. Although not as spectacular in the photo department, the 5MP camera shoots awesome 720p video, and when you throw the Wave’s prowess at playing back high-resolution video in various formats, we really have a true multimedia powerhouse at our hands. Finally, the Samsung Wave S8500 is super fast, making everything happen almost instantaneously. Now for the bad. The Bada operating system is far from being perfect right now. It does make things work really smooth, but still has quite a few kinks to get worked out. Most importantly, the small annoying details in the interface that kind of hamper the overall user experience. The other deal breaker here might be the very poor application catalog in Samsung Apps right now. The Samsung Wave is available in Australia for $469 outright from online retailer Mobicity or relatively low cost Vodafone cap plans from $29+. Thanks for the review. However, the true test of a phone from a company like Samsung is how reliable it is over the long term. For some reason Samsung phones (and they’re not the only manufacturer this is true for), don’t seem to age well at all. I assume it’s down to the cheap components they use, I guess that old saying, “you get what you pay for” rings true here. I live in the U.S., and want to buy this phone. Where can I buy this phone, which can be used in the U.S. without problems for the 2G or 3G network? I have heard of 3G in Europe is different from 3G in the U.S., which is 2G, is too different? This phone is open. It means I can use anywhere in the world, including the United States? Do you think this makes no sense? There is flash browser support on the Samsung Wave watch the mobileburn 2nd video of the wave, its just naturally turned off. Really good phone, there are many useful functions. And the price is good for this model.